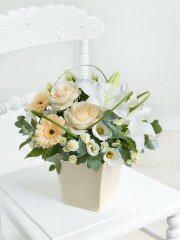 The simple combination of white, cream and ivory is pure and elegant. 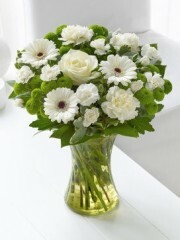 This sympathy gift is perfectly presented in a lime green vase, to enhance the delicate beauty of the carnations, soft germini and the immaculate large-headed rose. 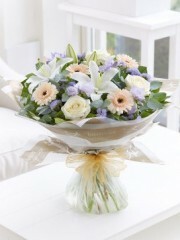 The soft shades of peach, purple and lilac in this beautifully scented bouquet are pretty and heart-warming. 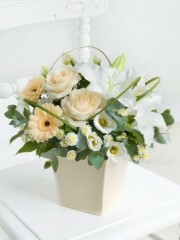 It is a lovely gift and a wonderful way to show someone you’re thinking of them. 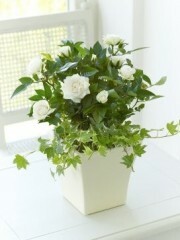 Including a pretty cream rose plant and trailing ivy, this simple yet evocative gift will let them know they are in your thoughts.Delivered in a cream, ceramic container this gift is ready to display instantly. 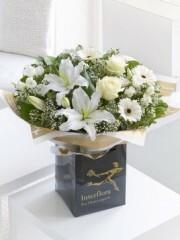 Scented white Oriental Lilies and luxurious foliage are presented in a stylish, cream ceramic vase finished with a 'Thinking of You' ribbon.This vase of flowers is ready to be displayed straight away and is the perfect way to say 'Thinking of You'. Featuring a white Oriental lily, cream large headed roses, peach germini, a white spray chrysanthemum and white lisianthus with steel grass, eucalyptus and salal, arranged in a cream ceramic container. At Dundee flowers we know how sad it can be when you hear of someone passing away and sometimes its nice to send sympathy flowers to show you are thinking of them at such a difficult period of time for them. Dundee Florist have several options that we recommend for such an occasion, some are bright colours too boost their spirits and others are soft colours and white as a mark of peace. Whatever you chose the flowers in this section of flowers Dundee are all appropriate to send as a token of your sympathy for the deceased nearest family and friends. Sending flowers is a way of showing support at a difficult time and the beauty and scent of the flower you send will be greatly appreciated. After you select the flowers or plant you like we will arrange it at Dundee flowers by our trained florists who will ensure it’s beautiful. We deliver it carefully to them so you don’t have to worry about that, We can deliver the same day, as long as your order is placed before 2pm so you can relax after your order is placed. 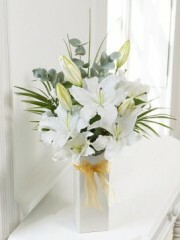 So to let someone know you are thinking of them at a difficult time one of out sympathy bouquets will let them know you are thinking of them.